Things are heating up at Paddy Power Casino these days! New Paddy Power Games customers will receive 60 free spins (no deposit) to play daily jackpot slots and a £30 bonus when they deposit and play £10... as seen on TV! There’s never been a better chance for you to win a jackpot! Throughout the entire month, Paddy Power Games TV advert is going to be on your screens, so head over to Paddy Power right now and be among the first ones to take advantage of their current promo! You will qualify for 60 Free Spins to play on online slots from the Paddy Power’s collection....with no deposit required! Who knows, one of these Free Spins may help you trigger the jackpot! New Customers only, 30 Free Spins Added to accounts verified by SMS, x1 Wagering, Selected games only. x25 wagering on matched bonus (£10+ £30 bonus), selected games only, eWallets excluded. Full T&C’s apply. 2. Sign up to Paddy Power or use your existing account and visit their casino section. 3. You will receive 60 Free Spins for use on all valid Daily Jackpot games. The free spins each have a value of £/€0.10. No deposit is needed! 4. To take part, you must opt in on-site, and supply a valid telephone number that is capable of receiving an SMS. You will then be sent a validation code to that phone which you must enter on site to redeem the free spins. 5. Plus, deposit €/£10 and receive €/£30 bonus! 60 no deposit free spins added to accounts verified by SMS (x1 wagering). Bet €/£10 on slots & receive €30 bonus. Free spins expire within 10 days & €/£30 bonus within 7 days. The offer is available to new Paddy Power customers from UK or Ireland who have a valid telephone number. What are Paddy Power Daily Jackpot Slots? Paddy Power’s unique daily jackpot slots are guaranteed to trigger every day before midnight and the jackpots have an average daily pay out of over £15,000. The highest ever Daily Jackpot win came from a player who staked £/€0.20 and hit a jackpot of £/€53,000! Looking for a comprehensive guide? Read here What are Daily Jackpot Slots. A slots bonus of €30 once you wager €10 on slot games across Paddy Power Games. In addition you will receive 60 Free Spins for use on all valid Daily Jackpot games. To receive these free spins you must opt in within the promotional tab. The free spins each have a value of €0.20 and will be available before wagering of the €10. 2. HOW CAN I TAKE PART? Only customers who are new to Paddy Power Games are eligible for this bonus. There is no opt-in required, simply register and wager €10 on any of our slot games on Paddy Power Games. Note that before you can withdraw the bonus you will need to clear the five times (5x) wagering requirement. The Daily Jackpot free Spins will have a 1x wagering requirement. Free spins on Daily Jackpots will be available immediately post registration. To qualify for the €30 bonus you must wager €10 on Paddy Power Games. 4. WHAT ELSE DO I NEED TO KNOW? Winnings will be paid out as a Games free bet bonus and can be used on slot games available on Paddy Power Games. Bonuses are non-transferable or exchangeable. Customer must wager a minimum of €10 on slot games on Paddy Power Games in order to receive the free €30 slots bonus. This €30 bonus will be credited once the €10 wagering required is completed. The free bet will expire after 7 days. Free spins must be used within 48 hours of registration. These free spins have a 1x wagering requirements. Eligibility to partake in the bonus will expire 30 days after the date the customer joined Paddy Power Games. The €10 bonus must be wagered five times (5x) before being released as withdrawable cash. 5. WHEN WILL I GET MY PRIZE? Bonuses will be added instantly to qualifying accounts upon completion of the €10 wagering required. By participating in the offer you agree with these Terms and Conditions. Paddy Power reserves the right to withhold any winnings and/or confiscate all winnings for irregular play. Entry will be forfeited if players are found to have multiple accounts. Paddy Power Games reserves the right to modify, alter, discontinue or terminate this promotion at any time for any reason what so ever without notice to players. BetAndSkill is the website offering more completely free offers on the Internet! 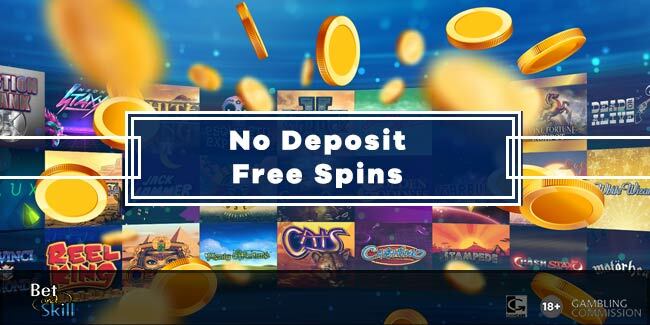 Just check our great no deposit free spins page and start gambling online with no risks attached! What are you waiting for? Betfair Casino no deposit bonus: £10 completely free chips! AS SEEN ON TV! 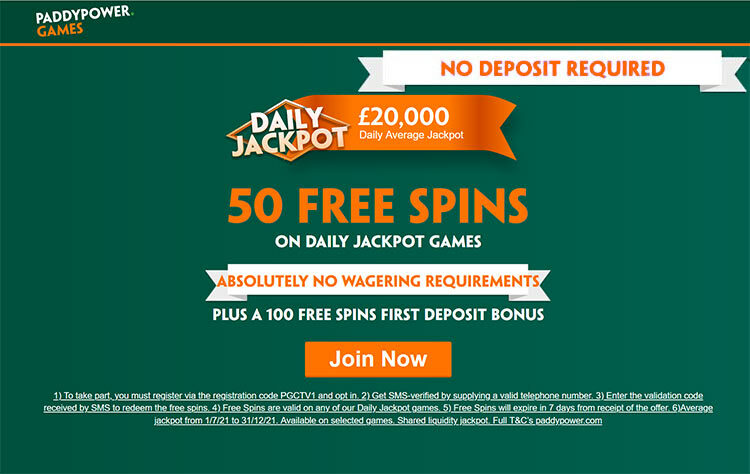 "Paddy Power 60 No Deposit Free Spins on Daily Jackpot Slots"